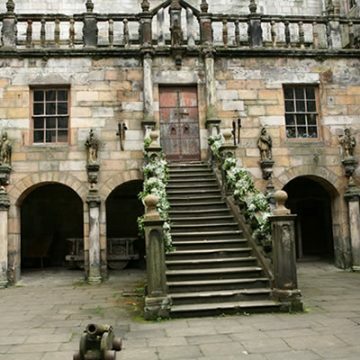 Chillingham Castle has tremendous potential as a location for film and television. The famous film “Elizabeth” staged many historic scenes here. 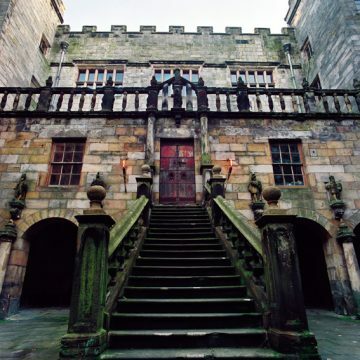 “The Making of Harry Potter” was based at Chillingham. T.V. Channel 4, “The Big Breakfast”, actually filmed the torture chamber implements as they stirred into ghostly action at midnight. BBC Channel 2 produced Jeremy Musson’s “The Curious House Guest”, featuring a very social house party at the castle, the family in residence, parties in the state rooms and horse riding expeditions into the beautiful hills and park. BBC Chanel 4’s “Meet the Natives” was an intriguing study of native cultures mixing, as Oceanic Tribesmen dressed for formal meals before displaying their grass skirted tribal dances. The Fox Family Channel’s “Scariest Places on Earth” dared a family, the Olsons, from a small town in Illinois, to fly over from the United States and spend the night at Chillingham Castle. The result was a night the Olsons, the Fox Family Channel and all the TV viewers will never forget! This became the highest rated event in the “Fox Family” history!